Apple’s new Smart Cover has made waves lately. Of course, when a new product like this launches, developers are quick to try and find a way to make their app work with it. Toughturtle has got out front to bring the first full featured financial app that interacts with the Smart Cover. The Smart Cover wakes up your phone and has several folds in it so you can just peek at the screen. They have integrated a beautiful ticker that you can quickly peek at by just lifting up the first flap on the case. The name Stockpeek is an incredibly fitting name for a product such as this, since you can literally peek at your ticker in the app by simply lifting up the case slightly. In addition to integrating the Smart Cover, Stockpeek is a fully featured stock app that offers everything you could want in terms of browsing and monitoring your stocks. For any serious trader, the one dollar price tag is very reasonable for what you get. They offer the ability to track an unlimited number of stocks, over 50 worldwide exchanges, full screen charts, and a slew of other features. Of course, if you don’t have an iPad 2 and Smart cover, the app is still fully functional – just without the peeking feature. 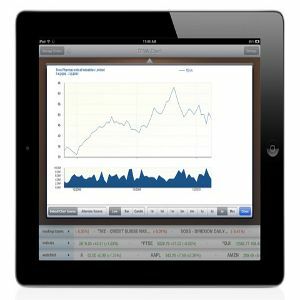 Explore more about: Mac App Store, Money Management.